The dust jacket of " Modern Spice: Inspired Indian Flavors for the Contemporary Kitchen" by Monica Bhide promises a cookbook full of modern spicy Indian recipes. Moinica’s book delivers on its initial promise with unique modern recipes with familiar flavors, such as, crab Tikkis, the Indian “burger”, curried egg salad with caramelized onion etc. When you start reading more, you realize that the book is actually Monica’s personal story of food, relationships, and culture accompanied with an excellent collection of modern Indian recipes. These personal narrations, such as “in search of authenticity – local is as local does”, “what is real cooking?”, are indeed my favorite part -- something I never anticipated, but an integral part of the book. "Modern Spice" starts with author’s favorite story of ham (not a typically Indian food but food nevertheless). The story illustrates reasons for traditional approach in cooking may be due to practical reasons during the past rather than a deep rooted reason related to flavor or nutrition. Indeed, ritualistic cooking without accounting for the new environment, can devoid us from a huge aspect of the particular food along with making us work longer for worse quality. Monica’s “Modern Spice” hinges on how to use the essential spice of Indian cooking in a changing modern, and her new home, an American kitchen. Although, any modern Indian food connoisseur can benefit from this book, it is more tailored towards the American readers, with practical advice on brands etc. As Mark Bittman, famous New York Times author wrote in his foreword, “there is not a cuisine that uses spices with more grace and craft than that of India”, and Monica exemplifies the concept with her modern recipes. “Modern Spice” does not simply dishes out a modern version of older run-of-the-mill recipes, but introduces dishes like chicken breasts stuffed with Paneer, that have quintessential Indian ingredient such as Paneer, but are not typical traditional Indian recipes. There is no uncomfortable wrestling to produce a pretentious fusion food either, but a true evolution that showcases spicy modern Indian fares. 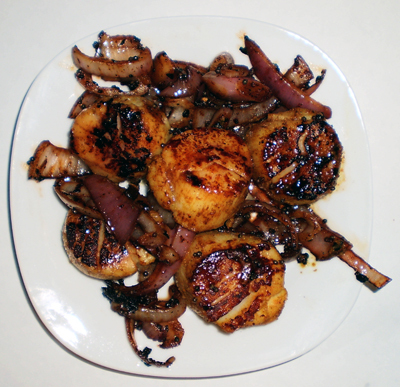 From the book, I cooked Curried Scallops (substituted carmalized onion slices). In less than 10 minutes, I had evolved modern Indian dish of sweet and delicate flavors of scallops in a mild spicy curry sauce. 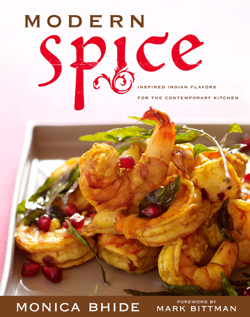 "Modern Spice" is one of the few books that can be recommended to both a novice Indian cook and a master Indian food chef. The recipes are easy to make, unique, and above all taste wonderful. In addition to spicy treats, Monica’s personal stories not only make the book entertaining but also makes it stands out among millions (ok thousands) of Indian cookbooks out there. Image: Curried Scallops. Copyright 2009.